The paper suggested distributing bumper stickers "in the ghettoes" calling for black vice presidential candidates. Paper: Bumper stickers calling for black candidates should be put in "ghettoes of the country"
Washington (CNN) -- President Nixon's campaign strategists hoped to create controversy among Democrats by fueling a push for a black candidate for the White House ahead of the 1972 elections, according to documents released Monday by the National Archives. 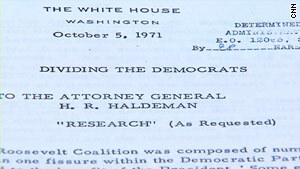 Among the materials is a strategy paper titled "Dividing the Democrats" found in the files of Nixon aide H. R. Haldeman, dated October 5, 1971. The paper, signed only as being from "RESEARCH," laid out perceived problems among Democrats that the GOP could use in helping Republican candidates, including Nixon, the incumbent president. Among the tactics the document called for is the distribution of bumper stickers that "should be spread out in the ghettoes of the country" calling for "black presidential and especially vice presidential candidates." As part of trying to undercut the Democratic challenge to Nixon's re-election, the paper said, "we should do what is within our power to have a black nominated for Number Two at least at the Democratic National Convention." Archivists who've been working with the Nixon materials believe the six-page paper was written by aide Patrick Buchanan. The National Archives, along with the Richard Nixon Presidential Library, released to the public some 280,000 pages of material, including handwritten notes and "carbon" copies of typed documents. The staff-level materials released Monday do not include any documents authored by Nixon himself. Historians may relish what may seem like trivial correspondence and meeting notes. "Some details had been out before, but these are materials that add fine-grain details to what we had before," said Tim Naftali, who heads Nixon Presidential Library. He told CNN, "It's very significant, and think of it as more dots to connect -- the mosaic is a little deeper now." Audio recordings also were released, but they do not include any additional material from the famous secret White House recording system that became a centerpiece in Nixon's downfall over the Watergate scandal. However, there was a note from the timeframe to Nixon secretary Rose Mary Woods, who during the Watergate investigation would struggle to explain a gap in recordings suspected of being part of the cover-up of misdeeds. The note released Monday was far more innocent. Woods was asked by a staffer to prepare an autographed color photo of Nixon to send to a man fired from his job maintaining the grounds at Nixon's home in California. Most of the audio recordings released Monday were made during internal briefings and events that Nixon attended. In one recording Nixon appealed to a bipartisan group of congressional lawmakers to support a tax to help pay for the war in Vietnam. In another recording, Haldeman speaks to high school students about anti-war sentiment, just days after the May 1970 shootings of protesters at Kent State University in Ohio. Reid's political future up in the air?